Carissa wore her first pair of shoes last week to church. I spent most of Sacrament Meeting putting them back on her feet and trying to convince her that it’s a good idea to leave them on. 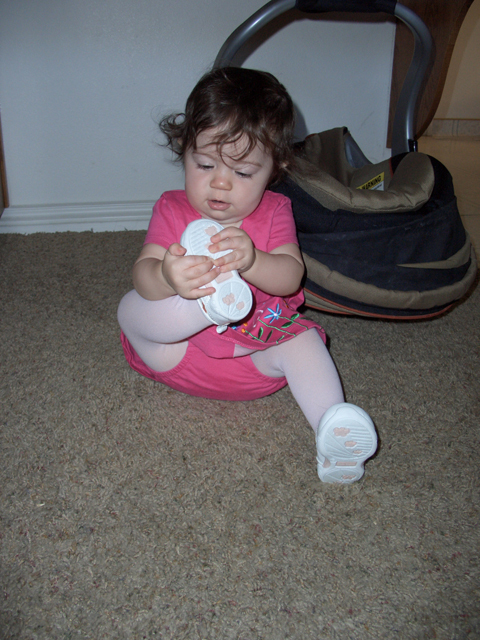 She is 11.5 months old now and can stand on her own, and sometimes she takes a few unsteady steps by herself. She is getting more personality and playfulness. She’ll pull herself to standing on the couch, and then plop herself back down and laugh, and do it over and over again. Sometimes she’ll make a noise, and I’ll make it back, and she’ll make it back to me, and we’ll go on like this for a while. She has her two front upper and lower teeth, and is getting two more teeth on top. 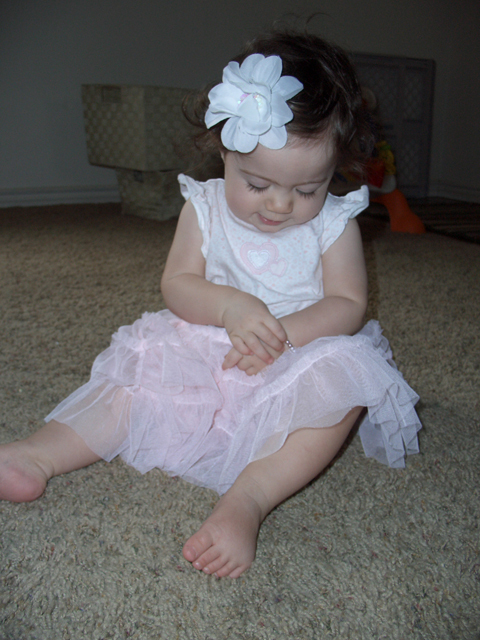 Today for church I dressed her like this, in a froo-froo skirt, flower for her hair, and a bracelet on her wrist. You can see she’s already taking off the bracelet, and the flower came off next. She ended up just in a dress, but at least she had that. She turns one in a couple of weeks. I look at her and can’t even believe that just a year ago I was still pregnant with her. Here she is, practically a lady already. Before I forget, I wanted to record some things Carissa has accomplished on her way to Big Girlhood. 1. She is sleeping in a crib. Finally. Gone is her cradle. 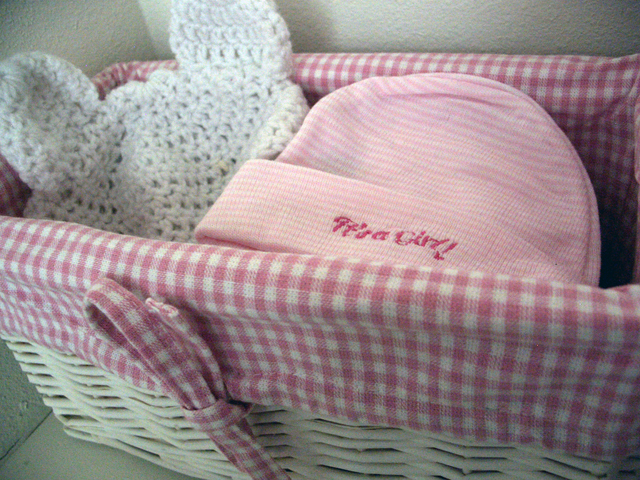 Which means I got to pull out the sweet pink and green crib bedding I’ve had packed away forever, waiting for this Big Girl moment to arrive! 2. She is feeding herself cereal puffs. 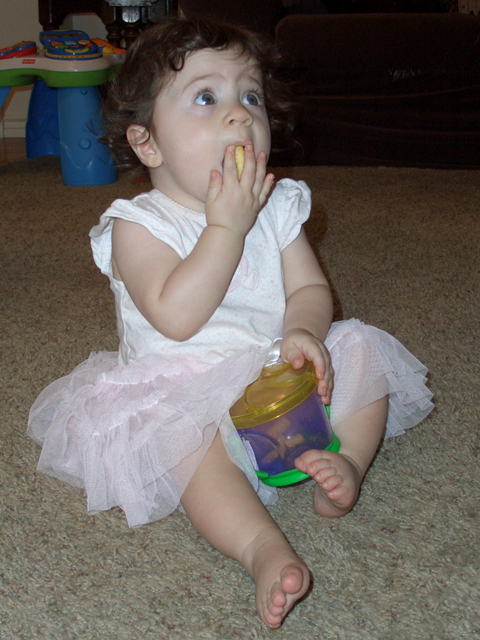 She can pick up food between her thumb and index finger and put it to her mouth. She gums the food well (in spite of my constant fear of choking) and is eating baby food so much better and more frequently than she used to. 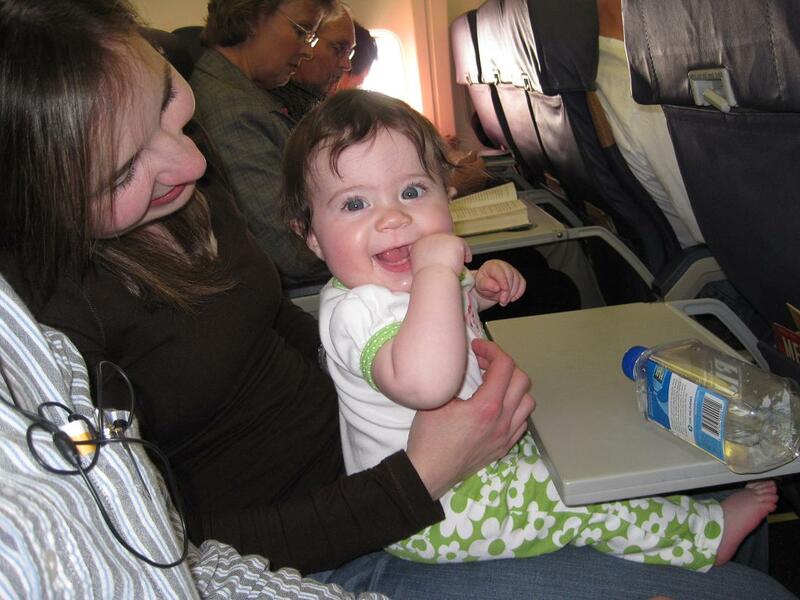 She prefers baby oatmeal, rice cereal, and pureed vegetables to anything sweet like pears or peaches. Strange girl. 3. She is so curious and her fingers are constantly reaching for something to explore. This could be good or it could be a bad omen, suggesting she will get herself into lots of trouble later. 4. She can get herself into a sitting position from lying down. Now when I go into her room after nap time she often greets me sitting up. Looks like we got her out of the cradle in the nick of time. 5. She is so close to crawling. From the sitting position she’ll put her hands down and be almost on all fours (sometimes her back leg is bent under too far), and she’ll rock back and forth. I can’t believe how far she’s come in the last few months. I remember distinctly how she hated tummy time and didn’t push herself up off her tummy with her arms extended, and I would think, “When will she ever crawl?” Well, she’s getting close! 6. She babbles a little. “Da da” and cooing is common. I love to hear her sweet girl voice. Definitely different than Wesley’s little boy voice. She also growls sometimes. 7. Her hair is getting longer! The bald spot in back is nearly grown in. And the hair over her forehead is so long it covers her eyes if it’s not swept to the side. Time to buy more hair clippies! 8. She loves looking outside. If Wes is playing in the sandbox I’ll set her in a chair by the door so she can watch. It is the easiest form of babysitting I know. 9. She’s nine months old, which means she’s nearly one. 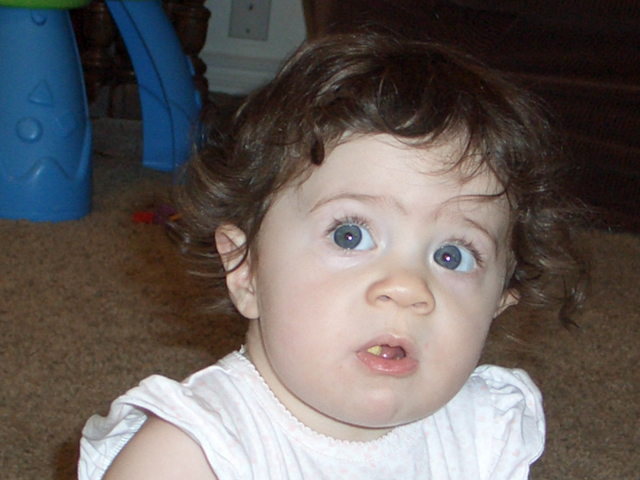 Which means she’s hardly a baby anymore and soon won’t be one at all. Sad and good, all at once. Today Carissa is thirteen days old. 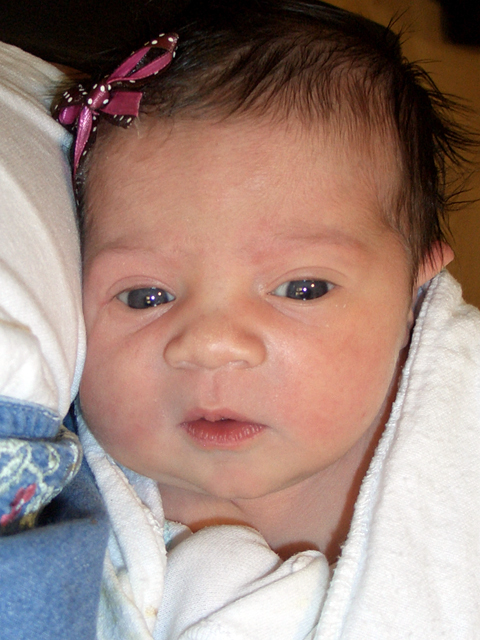 If she were Wesley, yesterday would have been the day we were allowed to bring her home from the hospital. Our birth experience this time was vastly different from Wesley’s. Both labors were about the same length (eight hours), and I delivered both babies without pain medication like I planned. 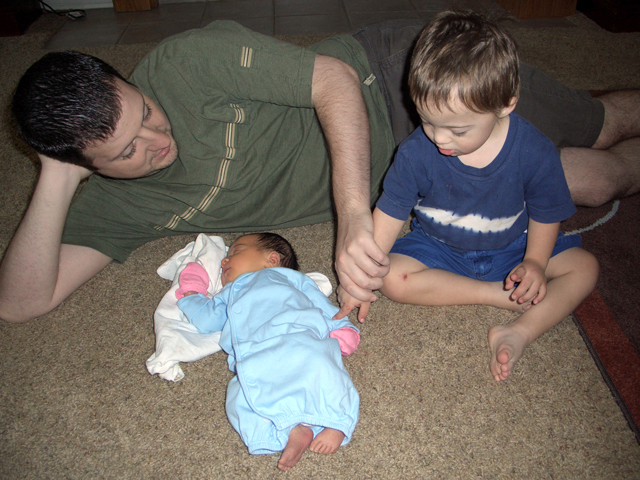 My labor with Wesley wasn’t too bad, but I had a hard recovery. This was because I had high blood pressure during labor, and to prevent seizures I was given an IV with magnesium sulfate. “Mag” (as the nurses call it) is rough stuff. It’s a smooth muscle relaxer that has lousy side effects. I was bleeding too heavily, my uterus wasn’t contracting, my speech slurred, I couldn’t sit up in bed without passing out… I was basically totally out of it. When they handed Wes to me after he was born I was too exhausted to hold him or even care much. 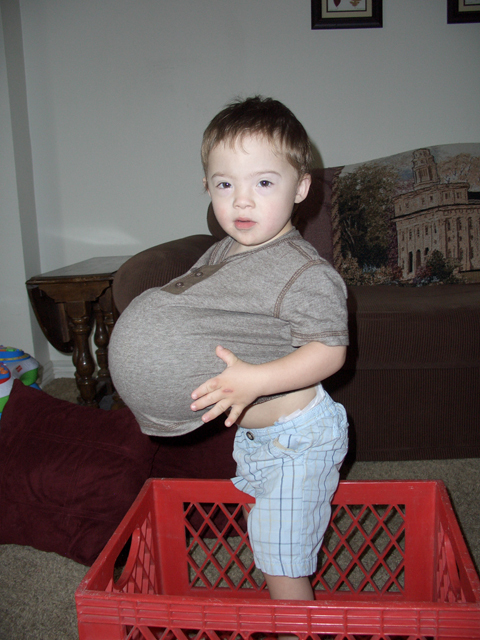 A few hours later, John and I were dealing with the surprise news that Wes has Down syndrome. It’s not a big deal now, three years later, but at the time we were devastated. With all this together, I remember lying flat on my back in bed and wondering if I was going to get through it. You’re supposed to be on the mag for 24 hours following delivery, but because I was handling it so poorly my OB took me off it after just 12. And once I was off it, what a change! Things got better from there. I could start to enjoy being a new mom. With Carissa, it was a little bit the opposite. 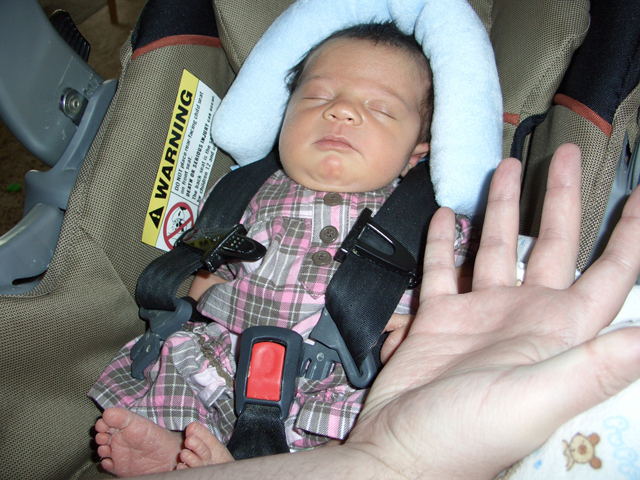 The labor was the hardest physical work I’ve even done (and hope to ever do), but once she was out things were OK. I didn’t have high blood pressure with her, which was a relief. With both babies my back hurt during labor; the difference was that with Wesley, it was manageable, but the back labor with Carissa was indescribably painful. It overwhelmed everything. 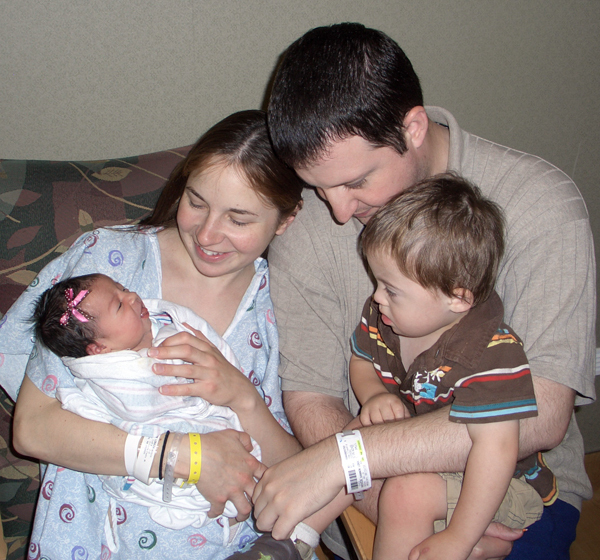 I had prepared for labor and delivery with breathing techniques that helped me through Wesley’s birth. Breathing and relaxing takes a giant bite out of the discomfort of uterine contractions. But it does nothing for back pain. I often wondered during those eight hours how I was going to get through it. I was so tired, and tired of the pain. The nurses reminded me to stay in the moment, focus on each contraction, and then relax, and don’t worry about what’s coming next. (Which is good advice.) I often thought how much easier it would be with some pain medication. But I knew what I wanted deep down, so I pressed through it. I was so grateful John was there. And I quickly saw that switching from an OB to the midwives (which I had done around 33 weeks) was a brilliant decision. 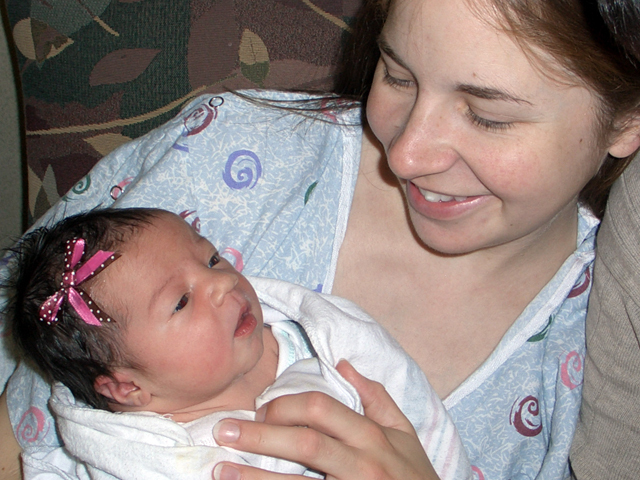 My midwife stayed with me for nearly all my labor. AND she helped with pain management by pressing on my hips and legs during contractions to help quell the back pain. She showed John how to do this, but (and though I love him) John didn’t have the same knack for it as she did. But John was indispensable; he kept telling me what a good job I was doing, and even though I didn’t believe him, it kept me going. After a while it became clear that the baby’s head was presenting at a weird angle. It was drawing out the labor and probably also causing that ridiculous back pain. Again, I was grateful for the midwife and supportive nurses who instead of offering intervention like forceps or a vacuum suggested different positions to help with things. They did suggest breaking my water but left it completely up to me whether I chose to or not. We discussed the pros and cons and in the end I decided to do it, and I don’t regret it. At what felt like long, long last I was ready for pushing. I have heard (and seen videos) of women giving birth where the baby just kind of falls out without them having to push or bear down, and maybe someday that will be my privilege, but so far that hasn’t been the case. I think that pushing is about the hardest part of baby delivery. You are so ready to be done. It is such hard effort to push and make your pushes effective. But at the same time, it is the best part. This time, perhaps because I wasn’t doped out on magnesium sulfate, I could fully appreciate my baby being born. John would tell me what a good job I was doing, and that I was almost there, almost done, that he could see the top of the head, and just a little bit more. The very best part of the whole day was the moment the baby slipped all the way out and the midwife placed her on my tummy. All the pain, all the struggle, was gone. In their place was total relief. And awe. To finally see the little person that had been growing inside my belly for the last 40 weeks… Sometimes I didn’t think there really was a baby in there, yet here she was. I was amazed by how calm she was, lying on my tummy. 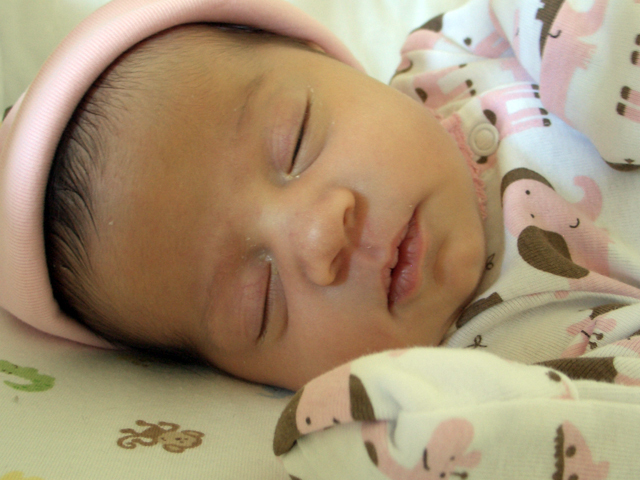 Her eyes were open and she was alert but relaxed, as if being born and taking her first breaths of air was no big deal. She was the most beautiful thing I’d ever seen. The hardest part was over. The better part was beginning. Without the mag or any other drugs in my system I was alert and able to watch the nurses bathe and measure her. I got to pick out the little bow for her hair. Sometime during my labor dinner had been brought in, and now I got to eat. Talk about a welcome meal. Two hours after she was born I was able to stand and walk. My mom and dad happened to arrive in town an hour or two before Carissa was born, and my mom came by to visit. 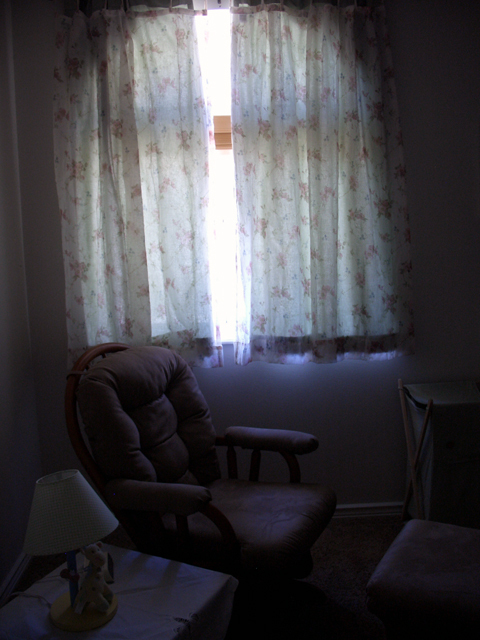 We moved to my recovery room, and 24 hours later, we checked out of the hospital. Wes was born with a long list of medical risks, and he came home from the hospital with an oxygen tank and sleep apnea monitor. The only thing we had to watch with Carissa was her bilyrubin numbers (for jaundice). I took her to the hospital three times to be tested, but eventually the numbers came down on their own without needing light therapy. Carissa is doing well, and so are we. Made it to 40 weeks; shall we try for 41? 2. Reading books. I just read Shannon Hale’s The Actor and the Housewife (mixed feelings about it) and am still reading Brandon Sanderson’s Mistborn. 3. Packing and repacking our hospital bag, Wesley’s overnight bag, and John’s hospital snack bag. John’s snack bag consists of beef jerkey, chocolate donuts, Gatorade, and Ding Dongs. When he saw the bag his face lit up, and then he added a few more Ding Dongs for good measure. 1. The Hunger Games book #3. Its release date is next weekend, I think. I pre-ordered it in April. 2. My folks coming to visit (i.e., coming to hold the baby). 3. Being able to turn over in bed without struggle. 4. Meals from the Relief Society. 5. Wes getting to wear his “Big Brother” t-shirt. This baby is definitely more normal sized, which Wesley wasn’t. I’m in constant amazement of how HUGE the uterus can grow, and how I can feel foreign objects inside me–like knees, elbows, and feet–nudging me (HARD!) in places where normally internal organs belong. To feel a foot poking out my side is pretty surreal. And it makes me think I’ll appreciate the movement more when it’s outside my body, where I can just look and not be obligated to feel. Yesterday was my birthday (I’m officially in the “almost 30” club) and I spent most of it cleaning the house and shopping for baby things. 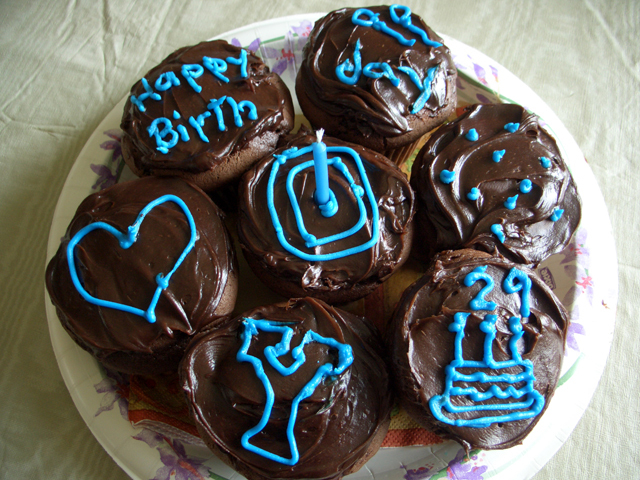 But thanks to my sister I got some terrific cupcakes. …and, you know, girl stuff. Unlike last time around, when Wes surprised us three weeks early before we’d had time to even find out where the hospital was located, this time we’ve already visited the (different from last time) hospital, figured out where to park and which entrance to use, and pre-registered. We’ve also packed our hospital bag and Wesley’s overnight bag for when I’m in labor. 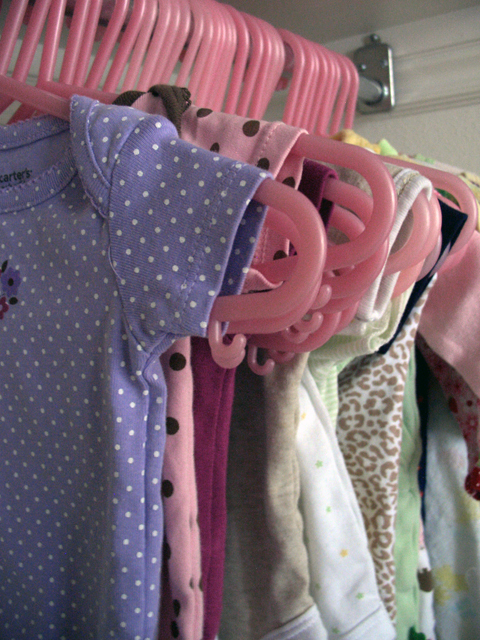 I picked out some baby clothes to take to the hospital, including a going home outfit for her. I still feel bad about how when we brought Wes home from the hospital we were kind of unprepared and had to borrow a blanket from the nurses to protect Wes from the rain. 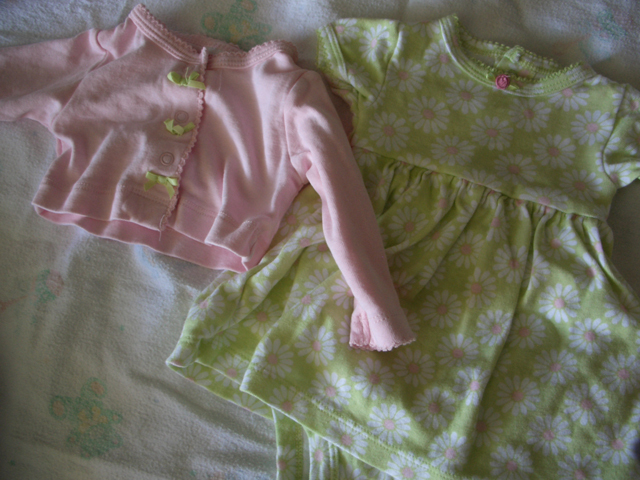 So this time I’m ready with blanket, hat, socks, mittens, onesie, sleeper, and of course a dress with matching cardigan. So now it’s the wake-up-every-day-and-wonder-“Is-this-THE-day?” routine for me. So far I’ve dreamed three times about having the baby. Amazingly in my dreams I either sleep through the labor and delivery part, or she just falls out, or I otherwise skip everything up until the part where she’s born and I’m holding her. Wouldn’t it be nice if it worked like that in real life?